How to use essential oils in your day is so simple. There is a lot of uncertainty over how to use essential oils and whether they are safe. I have had pretty extensive doctor’s appointments in the last year that revealed to me that my health is doing great with essential oils as part of my daily routine. 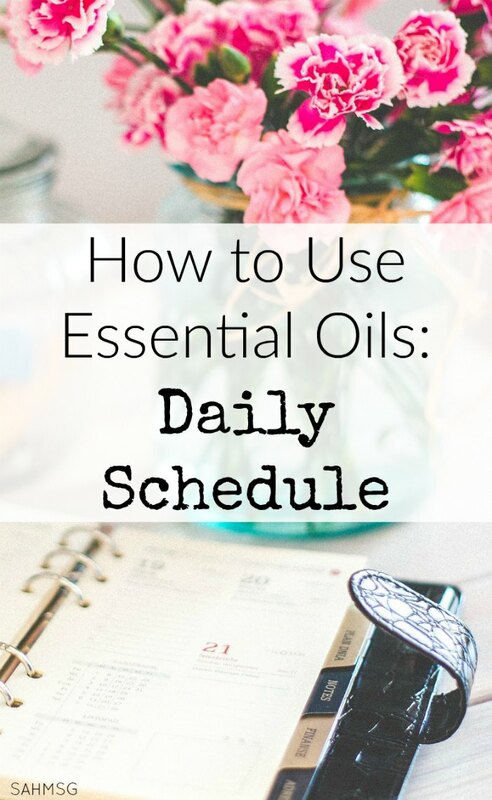 Sybil, blogger at She Lives Free, and I wanted to share how to use essential oils throughout your day to share our daily routines with essential oils. You probably already have a daily routine, this process will be simple. 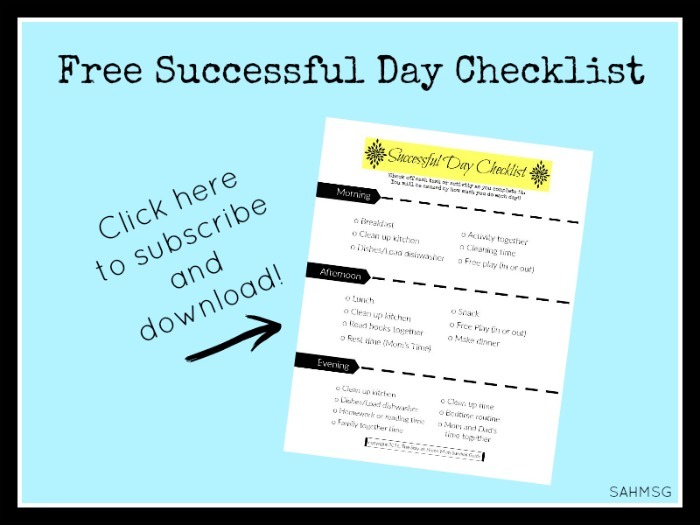 If you do not have a routine or schedule that works as a mom, read this post for ideas. To start using essential oils throughout my daily routine, I started working in essential oils as my old health and beauty products ran out. It was such an easy and beneficial transition. My overall outlook is more positive and I am supporting my health for the long term with natural means first. I am not someone who is anti-modern medicine. Modern medicine and medical technology could be credited to saving my life on a few occasions. Essential oils to me are a process of maintaining my health. Since I started using essential oils daily, I have had to rely on other means for supporting my health far less often-and some not at all. My morning starts with essential oils. Throughout my day I diffuse them, place them on my skin, use them to brush my teeth, apply them in lotions, wash dishes with them, clean with them, cook with them, and even steam clean my carpets with them. They make up the best diaper cream I have ever used on my kids, the soothing night cream I like to apply before bed, and they supported my immune system so well that I made it through the last year without much more than a stuffy nose here and there. Moms don’t get sick days, so we have to keep our bodies well. It is not hard to get started with essential oils. Most of my daily routine oils are found in the Everyday Oils collection that Young Living offers. Kids wake up and we head down for breakfast (and coffee for me!) I start diffusing almost immediately. Oils like Peppermint or R.C. help support my sinuses first thing in the morning and give me a little energy boost while my coffee brews. When the kids get ready, I apply tea tree essential oil to the twins’ scalps to support their skin. I apply Thieves to the kids’ feet (diluted in coconut oil) if we are headed to a playdate or location where there may be a lot of kids (and a lot of germs). When I get ready and try to look put together as a mom, I brush my teeth in the morning with Thieves toothpaste. 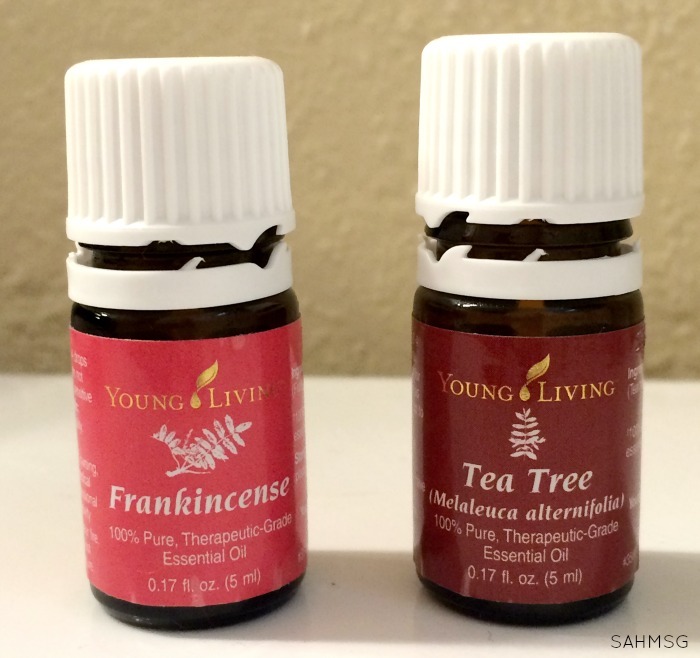 After I wash my face, I apply 3 drops of Tea Tree EO and 3 drops of Frankincense EO. I gently rub them into the skin on my face. Both support my skin because it can be acne-prone and I am at an age where the wrinkles are appearing. I never have that “oily” feeling on my skin at the end of the day since applying these two oils. They really support the balance of my skin. Oils are my favorite way to smell fresh every day. I apply one drop under my arms as deodorant, and often apply a bit to my neck and wrists as well. My body heat helps the scent stay fresh. White Angelica, Valor and Magnify Your Purpose are very uplifting scents. My husband was taken aback when I told him I stopped wearing regular deodorant. He asked me, “Are you going to stop shaving your legs too?” Ha! My reply was to ask him if I smelled bad at all. He told me no, so things are just fine with the essential oil natural scents. I reapply as needed, but only need to do this in the heat of summer or if I have been exercising. The scent lasts and is not over-powering like many prepared perfumes with synthetic scents. 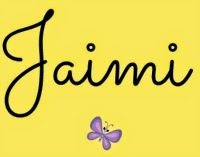 I make homemade lotions based on how I want to support my skin-or the kids’ skin. The freedom to make a product that is tailored to our skin is so helpful. A doctor told me that most lotions are mostly water anyway, so they really do not moisturize, they just make your skin drier as the water evaporates. Crazy! I apply a coconut oil/shea butter homemade lotion every morning to my hands, arms, legs and often even to the bottoms of my feet in the drier months. I rarely have to reapply my lotion for the rest of the day even after handwashing! Really. If I wash a sink of dishes, then I have to reapply, but otherwise-even washing my hands after diaper changes-my skin does not dry out. If we are home, I am often diffusing something. I love Magnify Your Purpose, Orange or Citrus Fresh, and Thieves always smells good. I clean my kitchen counters, the bathroom, the floors and even the windows with Thieves cleaner diluted in water. Amazing stuff! 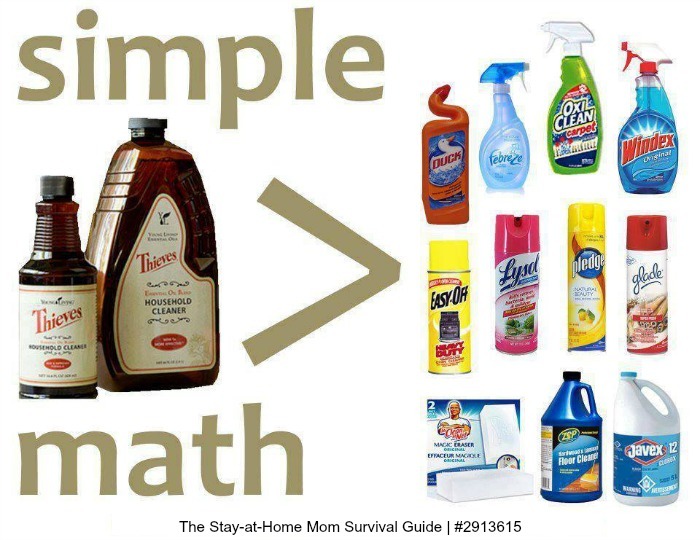 The house smells great, my hands do not get dried out like the cleaners that contain harsh chemicals, and I know the essential oils in Thieves cleaner are keeping my home healthy-even with 4 kids. During snack times, I often add Lemon Vitality essential oil to fruit salads or just to my water. My kids like sipping lemon water too, and since Lemon eo is less acidic than lemon juice, I feel good about them taking sips. This is great for avoiding sodas. Now that the number of kids in our house prevents me from focusing a lot of time on meal prep, I am always looking for ways to add gourmet flavor to simple dishes. I add drops of essential oils to jazz up my dishes. Rosemary, Lemon, Oregano or Black Pepper vitality oils are such a great way to add flavor, and they do not have an expiration date, so you don’t have to toss them when they get too old. (I don’t know how you keep oils long since there are so many ways to use them, but if you only use a little they have a shelf life of forever.) That Young Living premium starter kit price divided by forever gets to be pretty inexpensive then doesn’t it? In the evening, I like to diffuse oils that promote rest and relaxation. Essential oils like Peace & Calming, Lavender, Tranquil, and Thieves just make me feel more relaxed. I love that it is not just scent, but actual body systems support that essential oils offer. I feel better since incorporating them into my days. Before bed, I often diffuse in the kids rooms depending on their needs at the time. 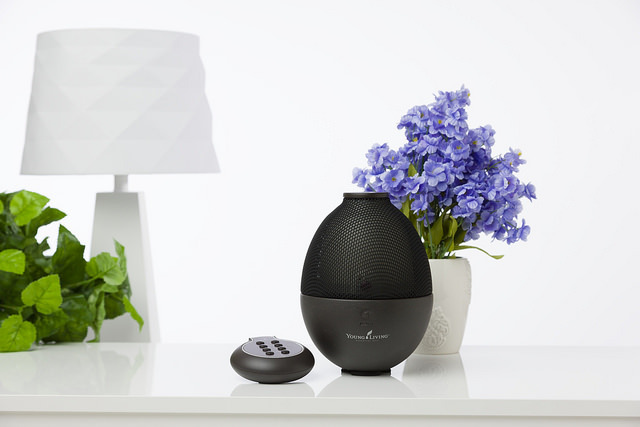 To promote respiratory support RC, or peppermint and lavender, in the diffuser are so nice. I apply lavender to any areas on the kids’ skin that need a little support, and I follow the same skin care routine with my oils before bed as I do in the morning. One additional step I add at night is applying Myrrh and Elemi to my heels if the skin needs a little support, and I often target areas on my face that need a little diluted Oregano oil. A few drops of oregano oil diluted in olive oil is a great spot application for night time. If I feel the sniffles coming on, I sip on this immune-boosting tea before heading to bed. It has not failed me yet! Since it takes me no time at all to fall asleep at night, I rarely diffuse in my room. This mama is a tired one come my bedtime. It’s a great life to have the blessing of family to care for each day and the natural means to support our health and live as healthy a lifestyle as we are able. **This is not medical advice, just my experiences and my thoughts on how to use essential oils in your day. If you have questions about essential oils or want to check out the latest deals I am offering on Young Living essential oils, you can view more about the Young Living Premium Starter kit. Right now you get $25 back plus multiple handy resources, a free eCourse, access to a Facebook group for asking oily questions, and “99 Ways to Use Your Starter Kit” free all when you sign up to save 24% off retail price with a Premium Starter Kit! You don’t have to sell a thing to get the wholesale member discount from Young Living. You can even sign up as a retail customer and not have to purchase a minimum amount of product each year. Wholesale membership is a great way to work at home as a mom to generate more income for your family if you are a stay-at-home mom. 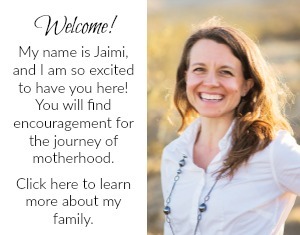 I have enjoyed the opportunity that being a Young Living member offers me in the way of classes, free resources and so much support. If I have a question about how to use an oil, the Facebook groups and upline leaders are always ready with so many helpful ideas. Sybil, helped me get started with Young Living. 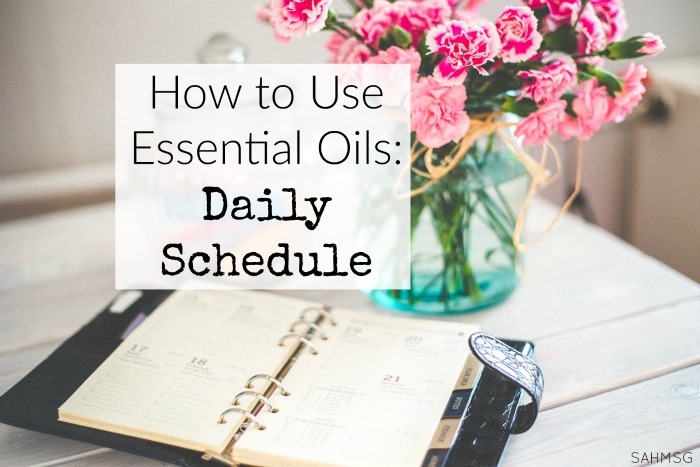 Check out her daily schedule with essential oils. Are you ready to support YOU? Start Here! What are your favorite ways to use essential oils in your day? I’d love to read your ideas. Nice post!! Can i apply Lemon Essential Oil directly on my skin? You need to dilute lemon essential oils in a carrier oil like olive or grapeseed before applying to your skin and apply to skin at night so you do not get sensitivity in sun exposure. Enjoy!